This is a story about strength of belief, trusted partnership, and a passion to excel. 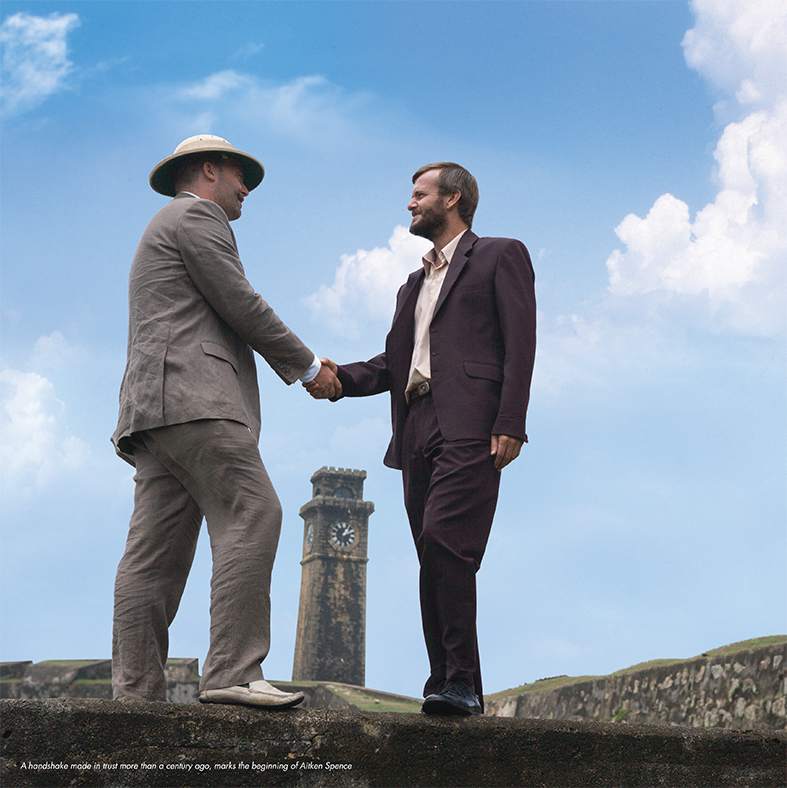 It all began in the 19th Century, when two Scottish gentlemen shook hands on an agreement that sealed a partnership, forming the beginnings of Aitken Spence. Over the years,the Company has steadily evolved into a vast conglomerate with a reach into almost every sector of the Sri Lankan economy. What began on the docks of port town, Galle on the southern tip of the British colony Ceylon, was the first small step of a long successful journey. The significance of these two Scottish men from different clans working out a business arrangement together, far away from home, has had a lasting impact on the ethos of Aitken Spence. To this day the company believes in the spirit of making long term partnerships and honouring them. The handshake made in trust all those years ago has become the hallmark of how Aitken Spence does business to this day; mutual trust and commitment is carried through every partnership the Company enters into. The strength of the Group’s partnerships lies foremost in the best practices itemploys in every sector of its operations. For Aitken Spence, sustainability and good governance are core values in driving business. Layer on layer, the Company’s management structure is designed and tailor-made to fit the diverse sectors it operates within. Apart from its business counterparts, Aitken Spence considers its employees the Company’s greatest partners. With a workforce that operates from tea estates to factory floors of garment industries and a large executive cadre; Aitken Spence adheres to internally accepted corporate accountability standards. This includes for human rights; equal opportunity irrespective of gender, race or religion; freedom of association; and the effective recognition of the right to collective bargaining. The Group rigidly complies with ILO conventions on the employment of persons, which eliminates all forms of forced or compulsory labour, and strictly ensures that no employees below the minimum legal age are offered employment. These policies are not merely looked at as the letter of the law; they are an embodiment of the Aitken Spence culture. The heart of the Group’s existence is in the partnerships it makes, be it in travel, cargo, power, hospitality, plantations or with governments. Over three centuries, Aitken Spence has grown into an entity that manages a vast landscape of diverse business, making partnerships and joint ventures, which are winning formulas for companies across the globe.